This exhibit includes selections from the records of Peggy and Nicholas Abkhazi held in the University of Victoria Archives, including material relating to the interwar period, World War II and the design and creation of the Abkhazis' internationally renowned rhododendron garden on Fairfield Road in Victoria, now owned by The Land Conservancy of BC (TLC ). The material digitized includes diaries, postcards, photographs, objects and watercolours. Marjorie ("Peggy") Mabel Jane Carter (later Pemberton-Carter) was born in Shanghai, China in 1902 to Mable and William Carter. Her parents died shortly after their return to England in 1905, and Peggy was destitute until she was adopted by Florence and Thomas Pemberton. Peggy traveled extensively with her adopted mother, during which time she met Nicholas Abkhazi in Paris in the 1920s. Nicholas Abkhazi was born in Georgia in 1899, the son of Helene and Constantine Abkhazi, a member of the Georgian nobility. Nicholas and his mother left Georgia for France following the Russian revolution. Circumstances separated Peggy and Nicholas, and she returned to Shanghai with her adoptive mother, who died in 1938. Peggy was interned by the Japanese, 1943-1945. Nicholas was also interned in a prisoner-of-war camp in Germany. In 1946, she moved to Victoria, BC, following friends who had retired. Peggy and Nicholas reunited in New York, were married in Victoria in 1946, and immediately began planning their famous modern home and garden. Nicolas died in 1987 and Peggy in 1994. The property at 1964 Fairfield Road is regarded as an outstanding example of the West Coast style and was purchased by TLC in 1999. 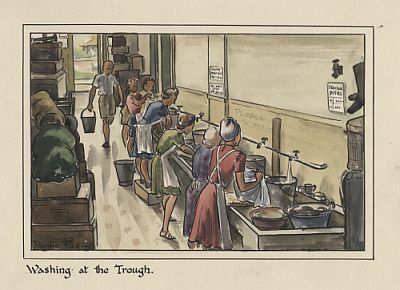 Peggy Abkhazi's diary (1943-1945), typescript and accompanying watercolour illustrations, and other items related to the World Wars. Material related to the design and development of the Fairfield property now known as the Abkhazi Gardens. Personal correspondence and legal documents including a passport, a marriage certificate, certificate from the Royal Horticultural Society and more. This collection was featured in "Archives and Archivists" by Lara Wilson and Sylvia Stopforth, British Columbia History 43:3 p.38-39.